ABUJA – PRESIDENT Muhammadu Buhari is currently meeting behind closed doors with members of the National Council of State at the Presidential Villa, Abuja. The meeting started at 11.a.m prompt at the Council Chamber. The Council of State is comprised of past presidents and heads of state, Chief Justices of Nigeria (CJN), leadership of the National Assembly, state governors among others. Presently at the meeting are former Presidents, Dr. Olusegun Obasanjo, Dr. Goodluck Jonathan, former Head of Interim National Government, Ernest Shonekan and former military President, Gen. Abdulsalami Abubakar. Others at the meeting are the Vice President Yemi Osinbajo, Senate President, Bukola Saraki, and former CJN Mohammed Uwais. Also present are the State governors from Osun, Kebbi, Zamfara, Plateau, Ebonyi, Adamawa, Edo, Lagos, Niger, Borno, Ogun, Ekiti, and Kogi. Secretary to the Government of the Federation (SGF), Boss Mustapha, Head of Service, Winifred Oyo-Ita, National Security Adviser, Babagana Monguno, FCT Minister, Mohammed Bello and Minister of Labour and Employment, Senator Chris Ngige. 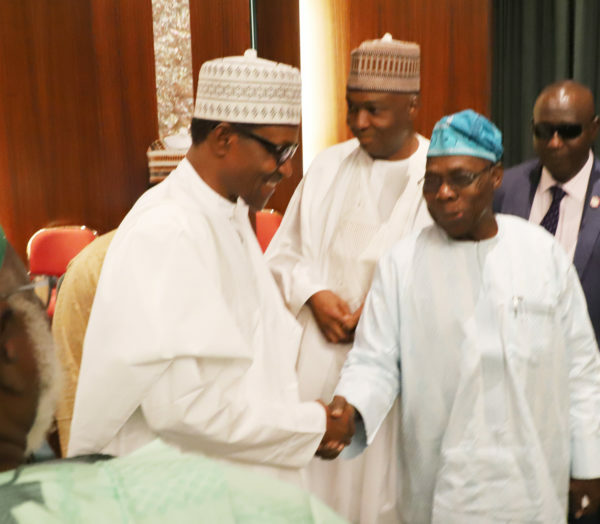 Pressident Buhari went round to shake hands with some of the past leaders including Dr. Obasanjo as soon as he arrived at the Council chamber. Obasanjo also offered the opening Christian prayer while Mohammed Uwais said the Muslim prayer. Former Heads of State Yakubu Gowon, Ibrahim Babangida and former CJN Mariam Muktar sent apologises for their absence at the meeting. Without listing the details of the agenda during the opening session, the Secretary to the SGF, Boss Mustapha said that the meeting will discuss five point agenda. But issues expected to be considered at the meeting include the National minimum wage, and confirmation of the appointment of the acting Inspector General of Police, Mohammed Adamu. The forthcoming general elections and security of the nation are also expected to engage the attention of the Council of State.